You may have looked at the giant green banana in the produce section and wondered what to do with it. Plantains are one of my favorite munchies. 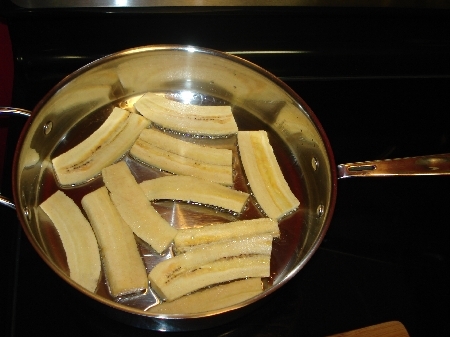 Usually served with tropical dishes, plantains are starchy and sweet only when they have black spots or are completely black, a state you would not should not eat a typical banana in, at least I wouldn’t because eating a black spotted banana is improper and should only be done in secrecy as it will bring shame to your family. 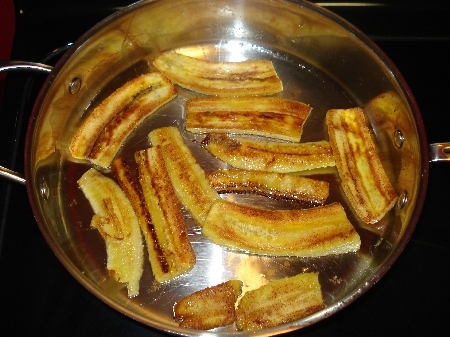 You can prepare fried or baked plantains, crisp and salty or soft and sweet which I prefer and will discuss here. 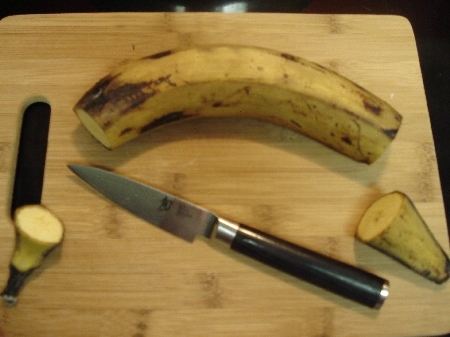 Start with a semi-ripe plantain with black spots, not completely black. 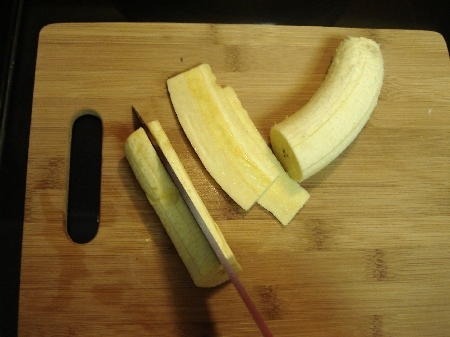 The plantain should give lightly to a soft squeeze. 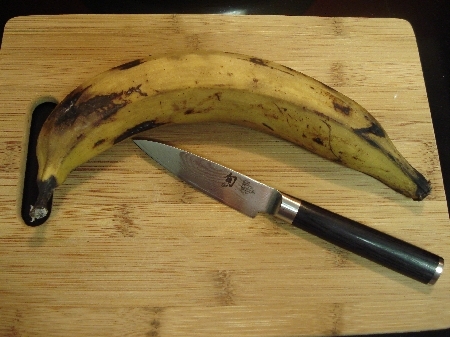 Peeling a plantain is not as easy as peeling a banana. To start cut the ends off of the plantain and cut 4-5 vertical incisions down the length of the plantain only cutting through the peel. 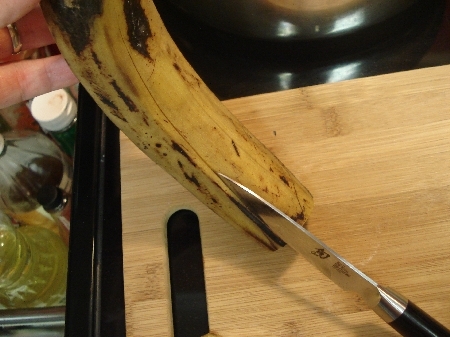 Next, pull each strip of peel off until you have a peeled plantain. 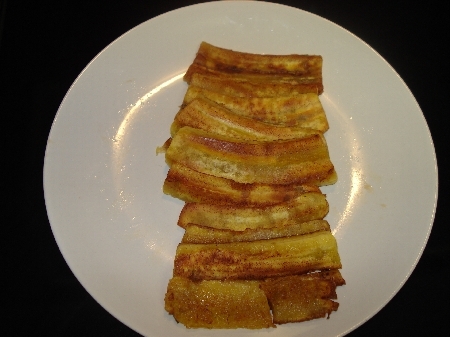 Cut the plantain in half and then slice each half lengthwise into 1/4 inch thick slices. Arrange the slices in a shallow pan with a couple tablespoons of vegetable oil over medium-low heat. Don’t cook them over very high heat as the sugar content can cause the plantain to burn quickly. About 8 minutes per side until dark brown flipping each slice as needed should do. Occasionally, I’ll add a dash of allspice or cinnamon to the slices but most often I add nothing to them as they are perfect unseasoned. When finished cooking move each slice to a plate with a paper towel to remove and excess oil then munch! Start with a semi-ripe plantain with black spots. Yes, a Shun knife works best. 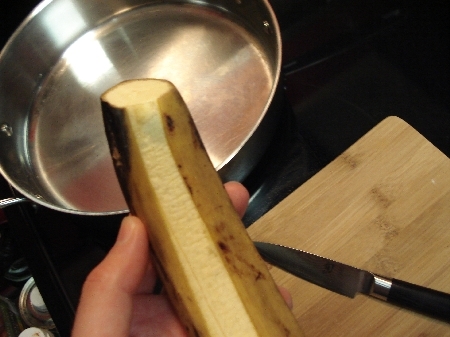 Cut each end off of the plantain before peeling. 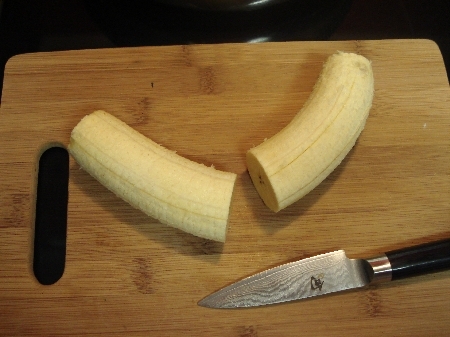 Cut the peel lengthwise 4-5 times down the entire length. Pull each strip of peel off individually to peel the plantain. Slice each half into 1/4″ thick slices. Arrange slices in a pan over medium-low heat with 2 TBS of vegetable oil. Flip the slices when they become dark brown, about 8 minutes each side. 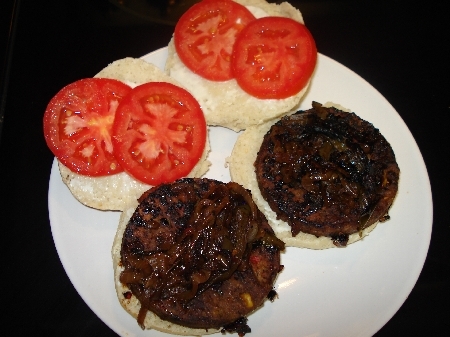 Great served with my favorite junk-food, veggie burgers! Looks good. I’ve never had success in cooking plantains and I don’t even know why. Maybe, I’ll give it another shot. So that’s how you peel a plantain! I’ve always tried digging the peel off with my finger nails and I usually end up getting some stuck under my nail and it hurts. I love fried plantains though. after reading through several of your posts, i am extremely respectful of you and the work youve put into this wonderful blog. so, thank you. Thanks for the great complement. I don’t know if I am worthy of such but I appreciate your thought and your visit.